What would it take to put in a simple bridge at the end of Fremont Blvd? Imagine the possibilities. The 400-mile Ring Around the Bay, or the Bay Trail, is supposed to be a recreation path encompassing the entire nine-county San Francisco Bay. It was enacted into law — sponsored by Bill Lockyer — back in 1987, called Senate Bill 100. We’re getting there, but at a snail’s pace. Regardless of the politics, wrangling over land owned by Cargill, and funding, it would seem we could make some simple improvements at almost no cost to keep things moving. Case in point: A temporary bridge over a narrow waterway would do wonders for anyone riding a bike through Fremont near Coyote Creek. At the end of Fremont Boulevard a bridge could be added (or even a wooden plank! 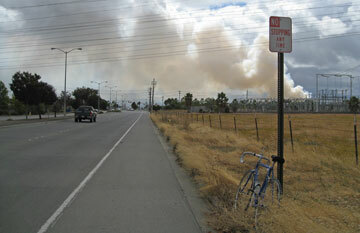 ), allowing access to Dixon Landing Road and then the northernmost reach of Coyote Creek Trail. Even better would be access from Cushing Parkway south, but that’s probably too much to ask at this time. Instead, cyclists have to ride the Warren Avenue 880 overpass and then take Kato Road, which gets my award as “Worst Road in the San Francisco Bay Area.” That honor used to belong to Evelyn Avenue in Mountain View/Sunnyvale, but it was repaved years ago. If I were the CEO of Solyndra and other technology companies nearby, I’d be all over the city of Fremont to get this road fixed, and I might even offer to pay some of the costs. It’s an embarrassment to have customers visiting a solar technology leader located on a third-world road. The good news is the city put the repair out to bid in August. As expected, Newark and Fremont don’t have much to offer in the way of scenery where I rode, all the more reason why bayside trails would be a public asset here. A controlled burn out on the bay that day didn’t help matters. I hope there really is a bridge here now, and it just doesn’t show up on Google maps, but I doubt it. Now let the excuses begin. A controlled burn in Newark as viewed from Boyce Road. Lovely. This entry was posted on September 9, 2010 at 6:17 pm and is filed under News, Ride reports. You can follow any responses to this entry through the RSS 2.0 feed. You can leave a response, or trackback from your own site.